The team at Big Oak Citgo strives to maintain a careful balance of innovation and tradition for the benefit of our customers and our business. From outfitting the shop with the latest technology that allows us to work on vehicles with precision to developing novel ways we can reach both established and new customers, we always have an eye to the future. There is, however, no modern substitute for the old-fashioned customer service and values that we embrace at every opportunity. 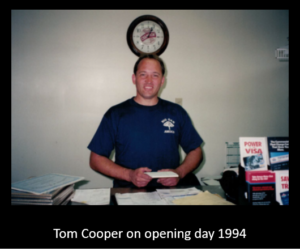 In 1994, Tom and Jane Cooper began this auto repair shop journey with resolve – to provide excellent customer service and exceptional workmanship to their community. In return, our customers have returned for generations and endorsed us to family and friends. Throughout the decades, the message remained the same, but the medium has changed – In the old days, neighbors had conversations over the fence – “Hey, Jack… got a good mechanic? My catalytic converter is going!” “Sure thing, Mark… go see Tom at Big Oak. Tell him I sent you.” Now these referrals take the form of a Facebook post or Google Review – “New to the area, need to get my car inspected.” and responses that recommend the folks at Big Oak with a ❤ or 👍. Even still, the core message endures – the Big Oak team will take good care of you. Considering the current trends in automotive repair technology AND the importance of social media reviews, we remain steadfast in our commitment to our customers and community. Yes, we love that our customers recommend us to others – and we truly value that our customers give us a call when they have questions or concerns about repairs. We want you to think of us as your neighborhood repair shop – the place where you can talk with a person who cares about you and is happy to strategize with you to get the most out of your vehicle and investment. To that end, if we’ve done right by you, we would very much appreciate your honest review of your Big Oak experience – your Google Review is important to us in terms of attracting new customers and will help keep Big Oak serving you and your family for decades to come! What is top tier gasoline, and why do I need it?